But fortunately a seat for your bucket comes cheap. 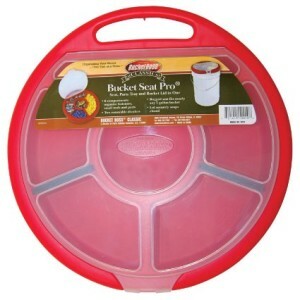 And even the most rudimentary bucket seat will make a bucket much more pleasant to sit on. These dual-purpose storage buckets don’t just stash gear in the body. The seat itself has separate compartments for fish hooks, nuts and bolts, nerf gun ammo – or whatever else you’re into. Padded bucket seats are for the long-term sitter. This one even swivels so you don’t have to pick a bucket up to switch from to scowling at eastbound traffic to westbound traffic. 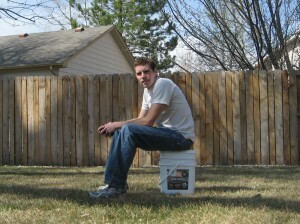 Bucket sitters take their buckets hunting or fishing – and a cushion between yourself and the ground will really civilize your quest for fresh meat. How about a bucket seat that mirrors the most important throne in your castle? Yes, a bucket can be a toilet too. Of course your bucket toilet should only ever be a bucket toilet. Choose your least favorite bucket and commit to that one for good. 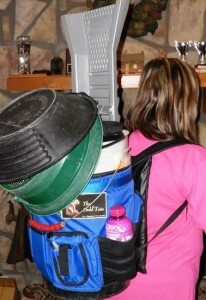 We used a toilet a lot like this to pack our crap out when we canoed the green river in Utah. 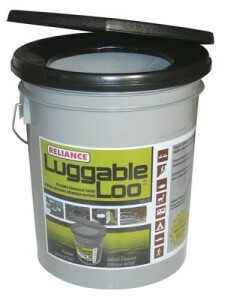 Get more details about this one at our Portable Toilet page. At least according to me, your resident bucket freak. Let’s start with #1 and go from there. #1 Grimeproof. Leaving a sofa out on the porch is risky. It could turn into a litter box for stray cats, or it could get damp then eaten by mold. But if anything unseemly shows up on your bucket seat – just hose it off! Good as new. #2 Posture Enhancing! Yeah, you could argue that having no back might be inconvenient. But I find that sitting on a bucket forces me to sit up straight. In a normal chair I have a tendency to slouch. So whenever my back is bothering me I sit on a bucket. Disclaimer: I’m obviously not a doctor so don’t take my health advice seriously. #3 Mobile. We sit on a bucket when we’re planting rows of potatoes. Or any other gardening task that requires being lower to the ground. 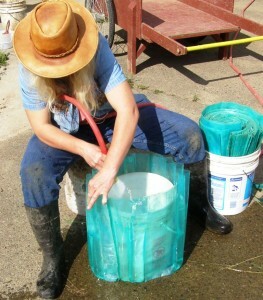 Here’s a photo of a Five Gallon Friend filling up wall of water greenhouses. One picture, 3 different uses for a bucket. Throwing a lightweight bucket seat on your bucket backpack means you can sit down after a long day of adventuring. Say you’re using your bucket pack to pan for gold – a pretty profitable bucket use if you ask me – well you don’t want to sit down in the mud to sift through the silt in search of gold flecks, right? 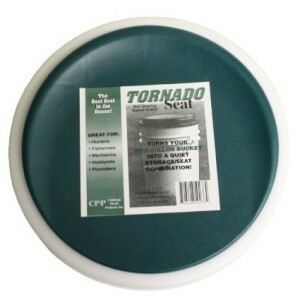 A bucket seat on your tool organizer not only keeps the rain off your electric drill, but it ensures a good place to sit while you’re munching a sandwich at the job site. If your hands were made for typing instead, maybe you took my non-professional spinal health advice and want to try an office bucket. Office chairs always have wheels on them right? 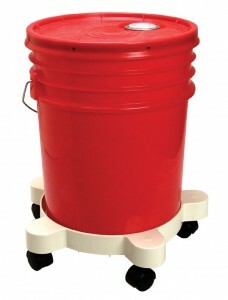 Well you’ll be happy to learn you can put wheels on a bucket too, with a bucket dolly.